No, that's not a typo. When people bemoan the fact that faster-than-light travel seems physically impossible, and even travel at near the speed-of-light is phenomenally difficult, they somehow jump to the conclusion that humanity is forever denied the stars. That's just wrong, and I'll tell you why. I am a child of the space-age, and I'm as reluctant as anyone to give up the visions of Heinlein and Star Trek; of heroic humans cruising almost effortlessly from star to star in space-ships made of rivets, steel, and atomic power. In fact, a bit of me isn't ready to give up on faster-than-light in some form, even if I regard this is more of a comforting illusion (and insurance against an often-surprising future) than a real possibility. But let's assume it is impossible, and then consider, why do we need it? Well, the answer may seem obvious. Captain Kirk can sail between stars in days or weeks (bedding down with a rainbow of alien babes at every one). He won't spend his entire lifetime getting to Vulcan, or be forced to start out, hoping his great, great, great, great grandchildren will survive to see the place that he won't. Survival. That's the great stickler. It's the human lifetime that the real limiter here as much as the speed-of-light. Let's face it, mostly even our wild imaginations don't have us traveling at infinite speed. Even on Stargate, they seem to spend several seconds whooshing through the wormhole before stepping out on another world. That few seconds constitutes an arbitrary finite speed. The four-plus years it would take, at the speed of light, to reach the nearest star is another arbitrary finite speed. Why is one worse than the other? It's a simple ratio. 4 years is a significant percentage of a human lifetime. Eight plus years for a round-trip is a very significant percentage. And that's just the closest star, and not an especially inviting one to visit. More interesting places start out further way to vastly further away. And that for a speed we don't have a clue how to approach. One solution that has long been proposed for this is the so-called "generation" starship, in which generations of humans will live, reproduce, and die during the voyage. It might work, but it seems most plausible to me as an act of desperation to me. If our sun were to suddenly show signs of going nova, we might well consider such a thing, but the idea that we might do it simply as a matter of exploration of colonization somehow seems more doubtful. Some large group of people has to step onto that ship into what will likely be a cramped, difficult life of limited-freedom and deprivation, knowing they'll never step off, and that they're likely condemning generations of their decedents to the same, or worse. It also seems a brute-force approach to the problem. Any generation ship is going to be massive, since it has to be big enough to hold a sustainable human population and all the resources that (even with heavy recycling) they'll need to complete their voyage and establish themselves somewhere else, and the problem of interstellar travel isn't just one of speed, it's of energy. Mass equals energy, and the relationship becomes very obvious once you start traveling between stars. There's also the possibility of suspending life, which in fiction, usually means shoving somebody in a plastic tube and freezing them (ala the Alien movies). But that's not the only way to do it, and in fact, we have a pretty workable technology for that right now. We can freeze embryos and later thaw them out. Currently, bringing that embryo to term requires a human mother to host it, but there seems to be no reason we can't think our way around that and create an artificial womb. So it's not difficult at all to conceive (no pun intended) of sending a small, robot ship to a distant star with some carefully preserved human embryos on board. On arrival, the robot finds a likely place with the necessary resources, digs in, spends years (or maybe decades) building a suitable habitat and support structure, and then brings one or more of its embryos to term. Now, one could argue, with robots of this sophistication, why do you need humans at all? Well, for starters, this is a very tricky and slippery ethical question to be asking (one advocates of all robotic space exploration should be thinking about very carefully). If you don't need humans there, why do we need them here? The obvious answer is that humans can do what robots currently can't. Robots can gather the data, but it takes humans to process it and appreciate it. But robots are quickly getting more sophisticated rapidly, and while true artificial intelligence is a more difficult problem than we initially thought, there's no reason to suppose it won't eventually be licked, and every reason to think it will be. So, planetary scientists, the moment the computer here on the ground is better able to do science than you are, and to write poetry about what that science means, are you ready to take your suicide pill and get out of the way? Me either. So shut up. I selfishly value myself, and by extension my fellow humans, and by extension whatever extended definition of "human" technology and society take us to, over any other intelligence we may create. Maybe that definition will expand to include the intelligences we create, just as it extends to our children and the children of our fellow humans. I'm okay with that too. But I'm not ready to have our machines go all Terminator on us and wipe us out, nor am I prepared to simply step aside for my betters. I am willing to accept them as equals and go forward from there. But enough of that diversion (much as I think it's relevant to my long-term conclusions here). Anyway, the "seed" ship crewed with embryos and robots seems viable, and in a lot of respects, a lot more reasonable than a generation starship. It's also a crude form of life-extension, and so changes that critical ratio with the speed-of-light. Captain Kirk can not only take on a new world in the prime of life, he can grow up there and experience it in the prime of childhood as well. But once he's there, he's there. It's not a "brave new world," it's the only home he's ever known, and probably the only one he'll ever know (except in recorded history). So what about just making humans live longer? Again, that's a much more difficult problem than science-fiction may have anticipated, but there are intriguing clues that the problem may be cracking. If humans can live hundreds of years, or maybe even indefinitely, that changes everything, right? Captain Kirk can jump into his one-man scout ship if he wants to, and spend a few decades getting to Vulcan, and still arrive there in his prime, no girdle or hair-piece necessary to impress the space-babes. Well, the problem with that scenario is that it does change everything, and long before you start thinking about space travel. Before we get that far, we'd have to work out the problems of long-life right here on Earth. Suddenly you've got a logistic and ethical nightmare to deal with around such basic matters as resources, access to life-extension treatments, and the right (if such a right exists) to reproduce. And even ignoring that, it also is going to change how we see the universe around us. If we're looking at potentially hundreds or thousands of years of life ahead of us, are we going to be less willing to risk it all on something as dangerous as star-travel? Good question, for which I have no definitive answer. But lets assume that all gets worked out somehow, and Captain Kirk climbs into his scout ships and heads off (at nearly the speed of light, somehow) with enough resources for his five-year-mission. What then? Hopefully, Captain Kirk bought his Kindle, because he's going to have a lot of time to read. Okay, let's assume that Kirk has something more sophisticated than that. Let's assume he has a holodeck, or something like it, so he can live a full, rich and interesting life on his way to the next star. Maybe he gets to command a make-believe U.S.S. 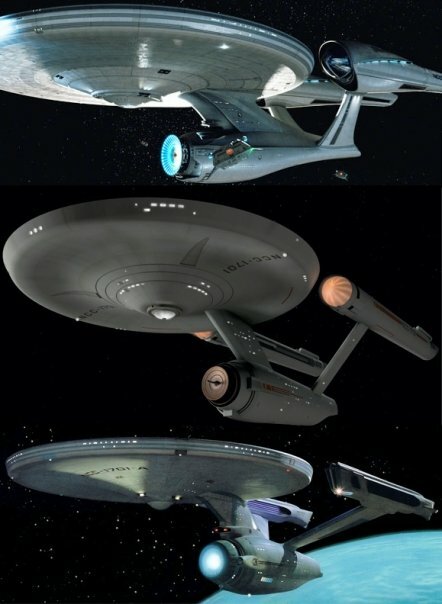 Enterprise and battle the Klingons (and bed the space-babes) all the way there. But if it's that great, here's the next question: when he gets there, why does he want to get off? Good question, and maybe that's the ultimate answer to the Fermi Paradox (if there are aliens in the universe, why haven't we encountered them already?). Maybe every civilization reaches a point where the enticements of their created inner-spaces override the limitations of the physical one outside. At that point, the physical universe simply becomes the platform on which they build their own, more accessible and possibly more interesting, virtual universes. It becomes like the silicon substrate on which computer circuits are made. Necessary to the functioning of the device, but not terribly interesting. Is that where our self-evolution is headed? Are we to be lumps of flesh, ever connected to the "real" virtual world, or maybe even cast that flesh off entirely? Such a creature could be long-lived enough, massless enough, to travel between stars with relative ease. But would it even want to? Would it even care about it any more? My hope is, we can do both, to enjoy our created worlds without limits, and also to explore the natural one as well. Certainly, for the sake of our own continuation, I hope we go far enough to insure our own survival, just in case an asteroid gets out of line and heads our way, or our sun decides to blow up or burn out. But I am hopeful, because one way or the other, and the laws of physics be damned, all we have to do is stay alive, keep advancing, and not kill ourselves. If we can do that, one way or the other, there's a universe just waiting for us to explore. And maybe more than one.